Jonathan del Mar’s exploration of Beethoven symphonies started in 1984 with the facsimile of the manuscript score of the fifth symphony. By 1985 Jonathan was in full flow correcting and editing these symphonies at the request of Caroline Brown who needed urtext versions for the use of the Hanover Band’s Nimbus recordings. This reached fruition in 1996 when Bärenreiter decided to start publishing Jonathan’s urtext versions beginning with Symphony No. 9. Mark was consulted for his views on various complex editorial decisions that had to be made. 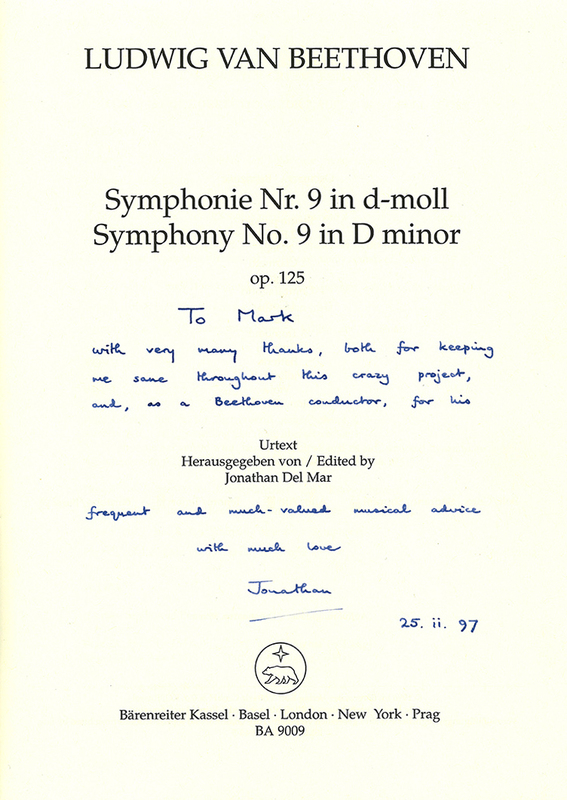 In 1988 Mark had his first trip to Vienna, invited by Jonathan for assistance in preparing his urtext score of the 9th Symphony. The Library of the Gesellschaft der Musikfreunde kept the manuscript orchestral parts used for the first performance which were thoroughly corrected by Beethoven himself in red crayon. The double bassoon part was of particular interest to Mark. As in Berlin, over the years Mark had projects in Vienna where he had good contact with the librarians at both the Vienna Philharmonic Orchestra and the Staats Oper. At the time they still had and used material used at premières conducted by Richard Strauss, and his own scores which he had neatly revised in places where there were balance problems. Markings found in Verdi, Wagner, Puccini etc were also of great interest, and of course Mozart (Figaro etc). Mark often sat in the staff Music Box by the stage with a good view of stage, pit and conductor. The style and high quality of their performances were also unique with a natural sweetness of tone. At that time, like BPO, women were excluded from the orchestra. Mark’s first Vienna Volksoper Musical Assistant project started in 1992 with Janáček’s ‘The Cunning Little Vixen’. After the opening performances Mark was asked to conduct the remaining performances starting on 1st March. Both Elizabeth Schwarzkopf and Eberhard Wächter visited Mark after his performances to give him their congratulations. Mark returned to Vienna for several years as Musical Assistant at the Staats Oper and the Kammer Oper (1995, Figaro in the Schonbrunn Palace gardens). These assistant conductor projects widened in 1995 to the Teatro Municipal, Santiago, Chile and the National Opera Company, with Mark making return visits over several years covering operas such as ‘Don Giovanni’, ‘Elektra’, ‘Jenůfa’ and more, such as ‘I Lombardi’ (1999) and ‘Norma’ (2000). Other such projects were at the Teatro Carlo Felice Genova production of ‘Roberto Devereaux’ (1993) which was followed later by Henze’s ‘Venus and Adonis’ (1998) produced by Pierre Audi. It was a great joy to encounter Henze again at the rehearsals. The projects continued at the Rome Opera House (‘Dialogue des Carmélites’ – 1991), Madrid, Teatro de la Zarzuela (‘Don Giovanni’ –1998), Hamburg Opera (‘La Traviata’), Copenhagen, Det Kongelige Theater (‘Jenůfa’ – 1998 and Ambroise Thomas’s ‘Hamlet’ – 1999), Kiev National Opera of the Ukraine (‘Il Trovatore’ – 1992). It was useful to have advice from their music director about Tchaikovsky’s ‘Queen of Spades’ which Mark was to conduct with KOG later that year. Mark was engaged as Music Director to conduct the world premiere of ‘Anacleto Morones’ by Mexican composer Victor Razgado in Spoleto at Teatro Caio Melisso (September 1994). The producer was Luca Ronconi using experienced singers and orchestral players from the London Guildhall School of Music. Razgado won the ‘Premio Orpheus’ prize for this work. Several well-known musicians attended Mark’s rehearsals. The first to congratulate him on his rehearsal work was Luciano Berio, followed by compliments from Marina Mahler (granddaughter of Gustav) who invited Mark to have dinner with her and Paul Crossley the following day. Theodore van Houten later put Mark in phone contact with Menotti to consider performances of ‘New Babylon’ for Spoleto. The phone calls with Menotti were charming and helpful. However Mark never had a chance to meet him before the composer’s death in 2007. Mark started preparations to conduct the KOG forthcoming (1989) production of Peter Grimes by visiting the Britten, Pears library at Britten’s Red House in Aldburgh. Most of Britten’s manuscripts and conducting scores, personally corrected and clearly marked, are kept there. The visit was more than worthwhile to understand how he interpreted his own compositions (as well as some other composers) and there were more visits on subsequent occasions when Mark was to conduct more of his works. 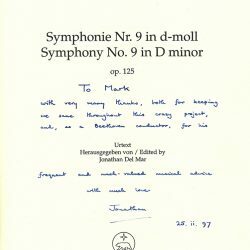 Paul Banks (the then custodian of the library) recommended Mark to also visit the ROH Library (Tom Tillery and Gina Boakes) who still kept, and used, the parts which were bowed and marked to Britten’s requirements when he first conducted ‘Peter Grimes’ at the ROH. This information has been more than valuable over the years, not just for concert excerpts but also ‘The Four Sea Interludes’. Mark still maintains good contact with the current ROH Library with mutual solutions of other’s situations as needed. One of the high points with ROH was to be part of the team who assisted John Copley in the revival of his fabulous ‘La Bohème’ production in September 1996. Other information from the Red House is also used regularly, in particular ‘Young Persons Guide to the Orchestra’. So far Mark’s performances have only been in Polish, German and Italian and not yet in English. The entrepreneur, Mark Bonello, was introduced to Mark in 1987 and soon became his industrious agent/manager having encountered Mark’s conducting for RIAS in Berlin. One of Bonello’s greatest achievements was Mark’s introduction to Lady Susana Walton in 1993 with a view to her becoming one of the reciters for Mark’s ‘Façade’ performance scheduled to be performed in Brighton in November of that year. The other reciter was to be John Amis (an old Alleynian Mark had already collaborated with in 1992). Unable to read music, Susana had already learned the part by ear for a recording with Richard Hickox conducting and Richard Baker reciting in 1990 with many following performances. With her fiery Argentinian temperament she was still keen for more, and gladly took part in the Brighton performance. Sadly Mark Bonello passed away in his prime in February 1995.